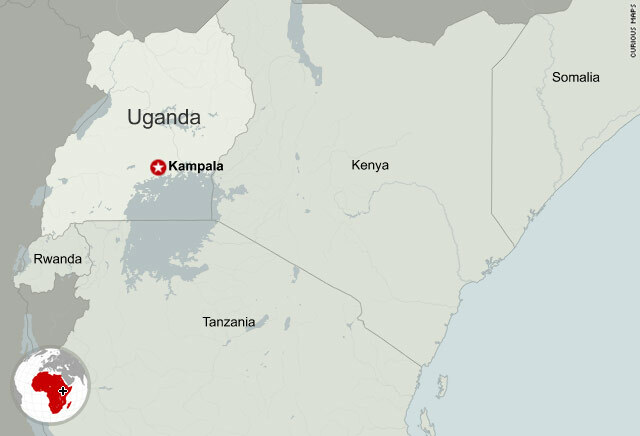 (CNN) -- Ugandan officials have recovered what they've described as an explosives-laden belt or vest in a trash can at a nightclub in a suburb of Kampala, the chief of police said Tuesday. Maj. Gen. Kale Kayihura, the chief of police, said the device -- found Monday -- was impregnated with ball bearings and was similar to those found at two sites where blasts killed at least 76 people Sunday. The device was found along with a detonator and what looked like a laptop bag, Kayihura said. When a journalist asked him whether this meant there was a third attack planned, he said, "It's possible there was." The police chief said that his office was working with international agencies -- but would not specify which ones. He also would not say how many people have been arrested in connection with the attacks and what their nationalities were. Earlier, Fred Opolot, executive director of the Uganda Media Center, said authorities had arrested several people but they have not yet been charged in connection with the attacks. "We are trying to find the culprits of this atrocity," he said. "I can't say I'm not worried, but it's not a question of worry," Kayihura said Tuesday. He said Uganda is no stranger to bombings -- "for decades, we have been fighting." The blasts went off Sunday at two venues -- a restaurant and a rugby field -- where crowds had gathered to watch the World Cup soccer finals. The fatalities included 28 Ugandans, one Irish citizen, one Indian, one American and 11 people who are either Ethiopian or Eritrean, according to the Ugandan government. In Washington, State Department spokesman P.J. Crowley said Tuesday the latest information indicates that 76 people were killed in the blasts. He added that five Americans who were injured in the attacks were evacuated from Uganda over the past 24 hours -- two to South Africa and three to Kenya. He also said that the United States has diplomatic security agents on the ground in Uganda, along with a small number of FBI agents. "I think the FBI is going to send a significant team... that will depart the United States this afternoon for Uganda at the request of Uganda authorities to assist in the investigation," Crowley said. A Somali Islamist militant movement on Monday claimed responsibility for the trio of bombings. "And the best of men have promised and they have delivered," said an Arabic statement issued by Al-Shabaab's press office and obtained by CNN. "Blessed and exalted among men -- (taking) full responsibility. ...We wage war against the 6,000 collaborators; they have received their response." The 6,000 figure is an apparent reference to African Union peacekeepers in Somalia. Uganda contributes troops to the peacekeeping effort. "We are behind the attack because we are at war with them," Al-Shabaab spokesman Ali Mohamoud Rage told reporters at a news conference in Mogadishu, Somalia. "We had given warning to the Ugandans to refrain from their involvement in our country. We spoke to the leaders and we spoke to the people and they never listened to us," Rage said. Kayihura said he could not say whether Al-Shabaab's claim of responsibility is legitimate. That will be determined by the ongoing investigation, he said. Somali Prime Minister Omar Abdirashid Ali-Sharmarke called on the "civilized world to unite in stopping the mindless terror enterprise of Al-Shabaab." "We will work with our partners in Uganda and the international community in bringing the cowards responsible for this heinous act," the prime minister said in a statement released Monday. Meanwhile, al Qaeda congratulated Al-Shabaab in a message posted on pro-jihad web forums. "Be pleased because all the sincere Muslims are with you joining you in your moments of pleasure and difficulty," read part of the message. The blasts hit within 50 minutes of each other. The first one struck an Ethiopian restaurant in a neighborhood dotted with bars and popular among expatriates. Two others exploded at the rugby center. Ugandan President Yoweri Museveni declared a week of national mourning for victims of the bombings, beginning Tuesday, according to a government statement. All flags on public buildings will be lowered to half-staff during the mourning period, the statement said.